Now for the final "B" ticket blow-out! This "Complimentary" "B" Ticket is from May 1971. Complimentary A thru E tickets were just the regular ticket, but have some extra printing. They got those cool Stars on the right, the wording "Complimentary" and the famous "X" serial number sequence. I hear these were given to CM's since they could get in the park for free, but they still needed tickets to the attractions. I think these were also given away at hotels/motels, and at the park because? If you know more about these "Star" tickets and how they were used, please let me know! Comparing this "B" to the 1969 one, you will notice the Motor Boat Cruise is back! This September 1973 "B" ticket is the last of this larger size. Motor boat is gone again! (See 9/75 below for more Motor Boat mysteries) and Alice in Wonderland has moved up to the "C" ticket, making for a really light "B" ticket. Nice rusty paperclip mark huh? New size appears in 1974! This "B" is from June 1974. The new size is much smaller, measuring 4 3/16" x 2". (my scans don't show the actual size, not sure how to do that!) This new size is NOT my favorite, you'll see as we get to the CDE tickets, there are so many attractions that the fonts get really small! You can barley read them! Plus they just don't "feel" as nice. This "B" got Alice back, and the Motor Boat Cruise is back again! 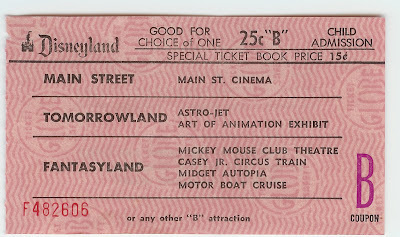 Here is a close-up of the 1978 "B" ticket. The Globe paper seems extra bold on this one, must have been a new batch! And just because it's so darn pretty, this May 1977 Knott's "B" ticket. Boy did these hold up over time, clean and vivid, just like new! I'm heading to the "Haunted Shack"! Setting the way back machine to 1966, the "B" ticket has a new size that will remain thru 1973, they are now 5" x 2 7/16". First up today, we have a Trio of "Castle Paper" B tickets. I call it Castle Paper because it has little Castle's as the watermark, they are not the usual "Globe Ticket Company" paper. I lay awake at night pondering why they chose not to use Globe paper during part's of 1966, 67 and 68.... I'm sure it bothers you too! I don't have an exact date for this first one, but it's got to be 1966 since I have never seen the Castle paper prior to 1966. It has the "Art of Animation", so it's got to be before 1967. I think they shut down most of Tomorrow land in late 1966 for construction of the "New Tomorowland 67" (my favorite version of Tomorrowland, by far). 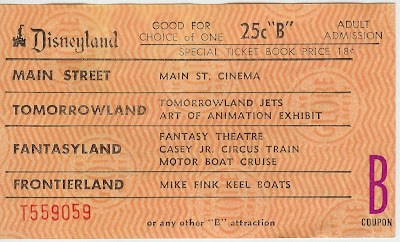 Other changes from 1965's "B" ticket; Tomorrowland Jets are gone (Already removed for the new Tomorrowland?, Did you know they changed the name of the "Astro-Jet" to "Tomorrowland Jets" sometime between 1963 & 65? Why did they change the name a few years before they changed the ride? ), The "Mad Tea Party" makes it's first appearance on the "B", the Keel Boats are gone, not even on the "C", and the Swiss Family Tree house was bumped down from the "C" to the "B". Now as we saw with the "A" ticket series, The "New Tomorrowland 67" has no room for low line "A" and "B" tickets! This May 1967 "B" has no Tomorrowland Attractions, you will need "C" tickets and above to pay for all that new stuff! The Keel Boats are back! 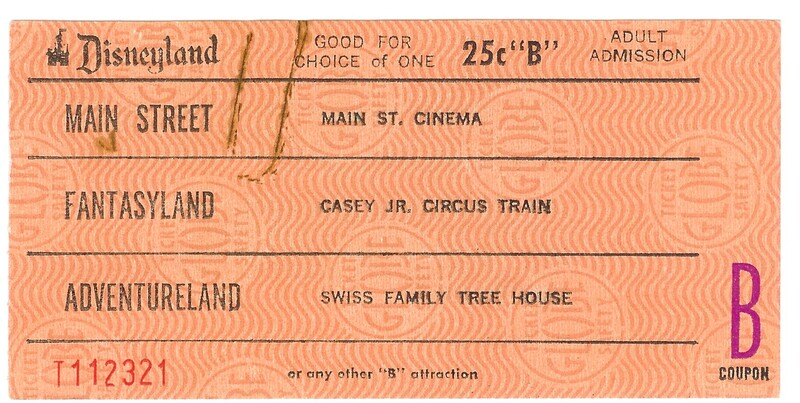 May 1968 finds the "B" ticket back on the warm and wavy Globe Paper, the paper that will continue on the A thru E tickets till 1982. The Motor Boat Cruise is Back! Sleeping Beauty's Castle is back (with an 's now!) I told you she'd be back.... And the Mad Tea Party is gone having spun its way back up to the "C" ticket. Once again, the Motorboat Cruise is gone, and not on the "C" either, was the ride closed for long periods of its run? 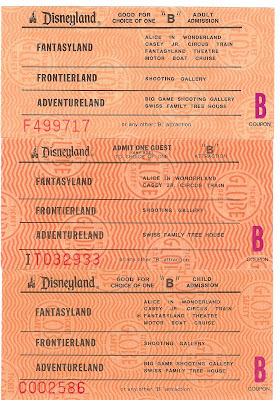 This May 1969 "B" ticket is down to four attractions now! And from April 1970, a nice "B" ticket, notice the color is a little different from the one above. Notice anything else odd?????? Yes, I have LOTS of KNOTT'S tickets too!!!! I love this stuff!!! Tomorrow we have the finale of the "B" Series, The "B" Ticket - Part 4 the 1970's! Today lets take a small detour from the "B" ticket series, a detour all the way to Japan! 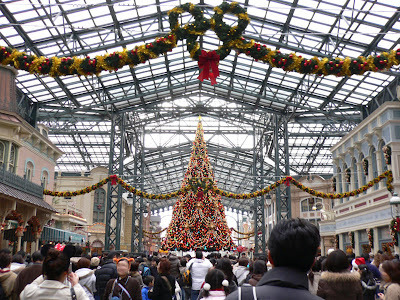 Tokyo Disneyland (TDL) has always intrigued me. I hear it is exceptionally clean and well maintained. 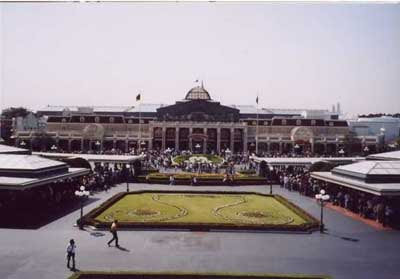 It opened April 15th, 1983 and was the first Disney park build outside the United States. Oddly, The Oriental Land Company owns the property and they license the theme from the Walt Disney Company. While I understand TDL is very much like the original Disneyland it does have some substantial differences. The oddest difference to me is the entrance. Main Street is completely enclosed, which helps for bad weather, but it looks rather strange. Ok, now to my Ticket related part of this post. From the opening in 1983 thru at least 1999 TDL sold tickets the old fashion way, in ticket books!! I know in 2006 they no longer had them, but when they stopped I don't know. If anyone knows exactly when the ticket book sales stopped, please let me know. The back is kind of plain, but lots of fun smiles from the Disney crew! And just because we are in the middle of the "B" ticket series, here is the "B" ticket from TDL! Notice it's "Westernland". I guess there is no literal translation of "Frontierland" so they choose something that better describes the "land". Before we get started today, lets look at how the ticket alignment changed during the 60's. 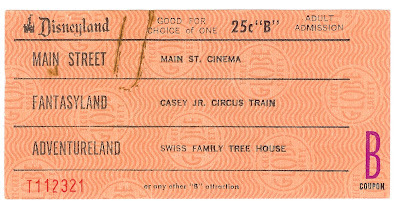 In 1959, when the ticket books with the new "E" tickets were introduced, the "E" ticket was the longest ticket in the book, measuring 5 1/2" x 2 7/16" (same height as money$$$), and the "A" ticket was the shortest at just 4" x 2 7/16". Some time after 1966 and at around the same time Walt's signature went away from the Welcome cover sheet (right around the same time he passed away, coincidence?) the order was reversed. Now the "E" ticket is the shortest and the "A" ticket is the longest! My theory; Since "E" tickets were obviously the most popular, it became cost effective to reduce the length and have the "E" tickets use less paper. Now with the size thing out of the way, lets look at some of the "B" tickets from the first half of the 1960's, all these in today's post are the shorter ones, 4 1/4" x 2 7/16". First up from June 1961, several changes from a year or so ago; Main Street Cinema has been added, moved up from the "A" ticket. The Astro-Jet was demoted from the "C" ticket and is now on the "B" ticket. Oh, and the "Art of Animation Exhibit" is new to the "B" ticket too, added to the "B" in June of 1960. And the Motor Boat Cruise is back after a total disappearance. Next up from June 1962, this Child "B" ticket has a pinkish color, some (not all) child tickets were different colors, but that's a post for another day too. 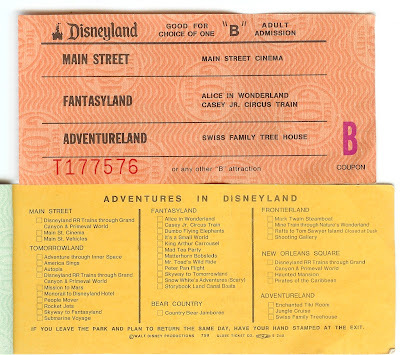 This ticket has almost the same attractions as the June 1961 ticket above,except Sleeping Beauty Castle is gone, kicked down to the "A" ticket! She'll be back! Help me out with this next one, from June 1963, it's got some weird stuff. 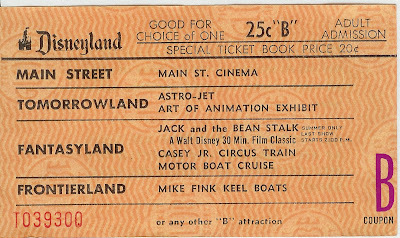 A normal change, addition of Mike Fink Keel boats, moved down from the "C"; But wait, the Midget Autopia is gone, seems to not be on any ticket after 1962? Odd since it was there till 66' (I think). OK here is the really weird part on this one. The Mickey Mouse Club Theater is gone, replaced by "Jack and the Bean Stalk"? Is that the year it came out? "Summer Only, Last show starts at 2:00pm" and in the back of the ticket book, it also reads "Papotin's Revue Begins 3:00pm" What was all this about? Does anyone have more detail, some pictures? ***** UPDATE ***** I found out what Papotin's Revue was! From another blogspot blog, "Then Walt DISNEY himself became interested in entrusting André to put on a stage show at Disneyland (California) during the Summer of 1963: Papotin's Revue delighted thousands of spectators through 518 performances." Someone PLEASE explain the Jack in the Bean Stalk thing, was that even a Disney Movie/Cartoon? And from when I was only one month old, June 1965. Pretty much the same as June 1963 except the "Jack and the Bean Stalk" thing is now called "Fantasy Theatre" something I remember very well, I spent many a hot 1970's summer afternoon in there watching Pluto and Mickey and staying cool! And just to see if you are paying attention, does this belong in this post? Tomorrow we take a little detour from our "B" series and head to "Tokyo" Disneyland! Are you ready for an in depth look at the beloved "B" ticket? I hope so, because this series has a lot to look at! 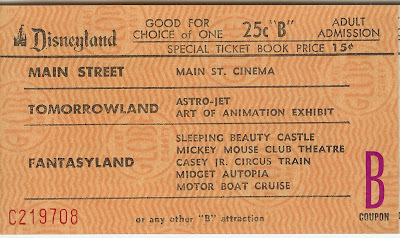 From Early 1957 this is how the "B" ticket looked, notice the odd comment on the bottom "All Attractions Subject to Availability" You would think this is something you'd see on the later tickets, but this is the only time I have seen it. Now sporting a price of 25 cents for all listed attractions. Hello Skyway, I think I'll used this ticket for you! 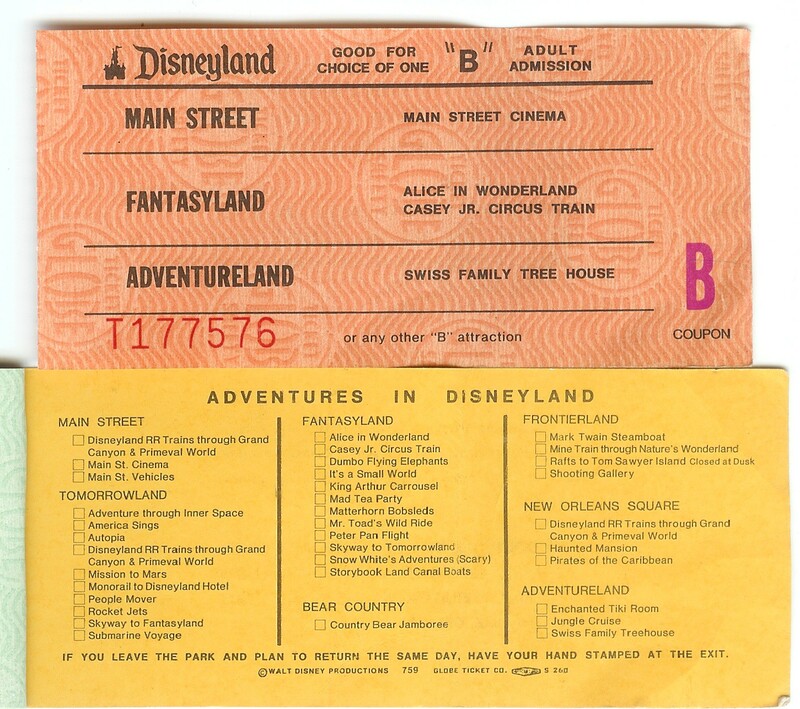 From the new "ABCDE" booklets, we have from June 1959, then new "B" Ticket. 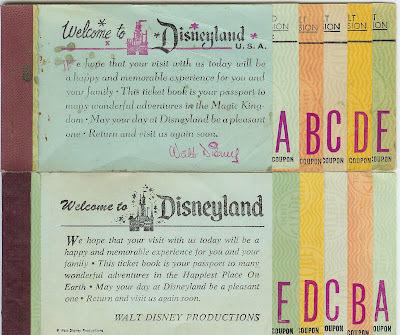 June of 1959 saw the introduction of the "E" ticket, with all Walt's new toys, they needed more lettered tickets! We will study the "E" ticket more in detail on it's own post series. Notice here Midget Autopia is back (whew! ), Frontierland Shooting Gallery has been moved up to the "C" ticket as well as the "Conestoga Wagons" (The Conestoga Wagons will only last for a little while on the "C" ticket, by June of 1960, they are not on any tickets...) And the "Skyway" was moved/upgraded all the way to the "D" ticket! Also notice the color of the "B", its now a Reddish color that will remain on the lettered tickets thru 1981. Nice low serial number too. Last up for the 50's "B" series is an odd one indeed. This is a lose ticket in my collection and as such I can not date it with total accuracy. I would guess it to be from the first batch of 1960 tickets or maybe a later 1959 batch (if there even was one). It's the same as the June of 1959 "B" ticket above, except that the "Omnibus" and "Horseless Carriages" have been moved (or downgraded) to the "A" ticket where they were the year before! Doesn't this ticket look weird with just one "Land"? Back from a brief vacation, I am ready to start again. For the record; this bloggin stuffs hard ya'll! For Sunday brunch we have a look at a couple of ticket books that are a little different. These were books you purchased once you were already in the park, they did not include admission, you are already in the park silly! 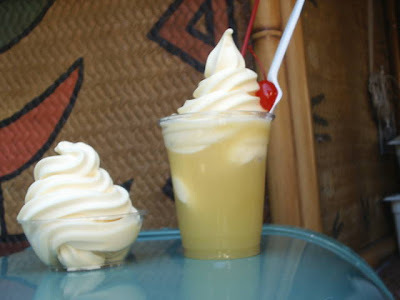 You would buy these at ticket booths throughout the park. Two reasons you would buy these; You either bought only a general admission ticket at the front gate (you cheap #$%@) or you ran out of tickets from the 10 or 15 ticket book. These books (especially older ones) are very rare, because if you bought these at the ticket booths inside the park, you are mostly likely ready to use it right away. First up, from June 1964, this is a Child "5 Adventures In Disneyland" book. I love the art work on these, you can even see the Fort and I think the tree house! 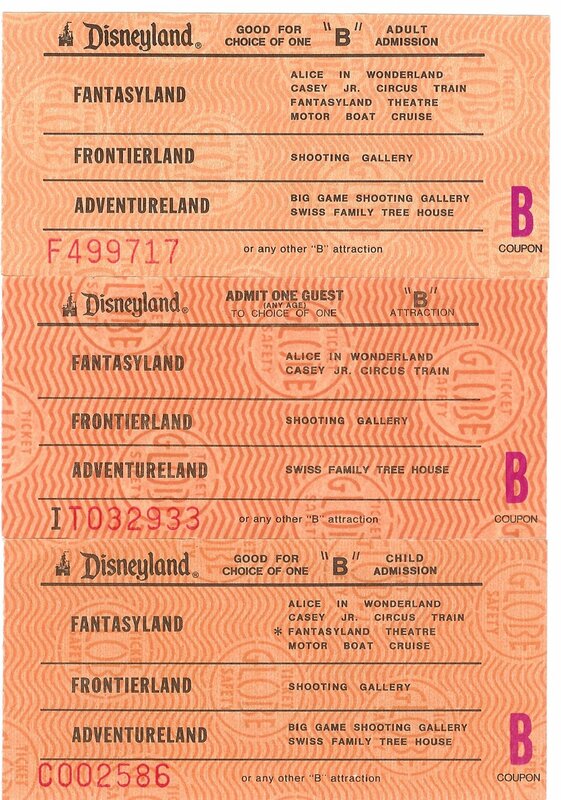 And you gotta love that wording in the scroll "This Coupon May Be Used For One Admission To Any Ride Or Attraction In Disneyland"
And the back shows your Maximum Value is $2.00, all this for just $1.60! Lastly today, for comparison from March 1972, an "Any Age" 5 Adventure book, this was $3.40 (a $4.25 value) and was for all ages. The artwork is still nice, but I like the 64' one better. This week: The "B" ticket. The "B" starts to get a little more complicated than the "A" ticket series, so we might see it broken into 4 parts, with a little break in the middle. I stumbled across this great video on the web last night. This is a great 30 minute home movie of a Connecticut family that won a trip to Disneyland in July 1956. It's a little campy, but SUPER views of Disneyland circa 7/56! I bet Disney doesn't even have some of these clear shots from 56'! Do yourself a favor and download the 2.0 GIG MPEG2 version, it is VERY clear and awesome colors. I am guessing they were using a 16MM camera. Great scenes of LA, Catalina, Knott's and more. Enjoy - I did. By the way, Archive.org has some fantastic stuff, if you have say 30 hours to spare, check it out! Special Events at Disneyland, how sweet they used to be. One of the main reasons I collect Disneyland A thru E tickets is because as a kid (Ok, I'll get this out of the way, I was born in 1965) I rarely used regular A-E tickets. My dad worked for PHCC (Plumbing, Heating Cooling Contractors) and we would always go once a year on PHCC night. We would get a ticket with a tag on it or a cloth sticker to place on our shirts. It would let us have unlimited used of all attractions (except the shooting galleries of course). 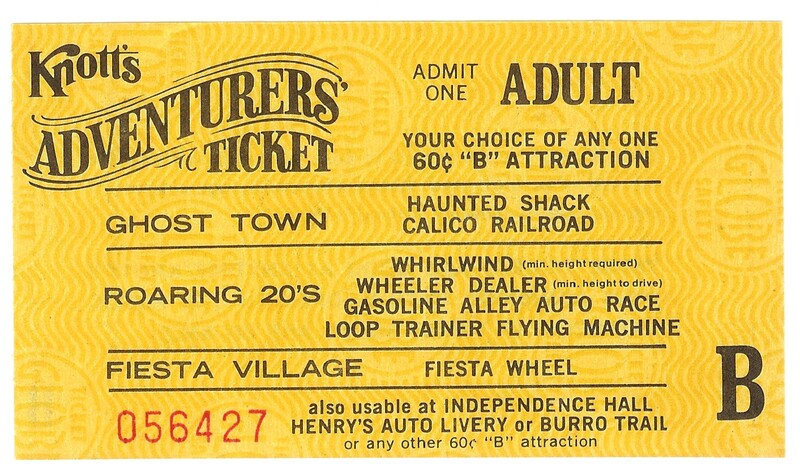 It wasn't until I went with my best friend and his family in 1977 that I actually used the A-E tickets. Having to "ration" your day at Disneyland sure was a different experience than having unlimited fun! But you know what? There is something to be said for trying to "use up" all your tickets. On that 77 trip, I rode the motorboat cruise for the first time just so I could use all my "B" tickets. First Special Event ticket for today is not really a special event ticket, but it is an unlimited attractions ticket, and its old and rare, so what the heck. From October 26, 1956 we have an "Special Adult Guest - Admit one". Presented to "CPO Charles J. Christel", compliments of The Marines at Camp Pendleton, CA! "Admission for one day to Disneyland and all its wonderful rides and attractions..." Can I use it to go back to 1956????? Next from September 22, 1967 this was a cool Friday night "Private Party at Disneyland" for System Development Corporation. 8pm to 1am, was the park closed for everyone else? How fun would that be! You'll find me in Tomorrowland 67' all night! This last one is interesting, 1st annual Private United Methodist Night, Friday, December 5th, 1986. What's interesting is this is an unused, voided, low serial number ticket. Was this a test ticket? Did they give these to the main gate ticket takers so they knew what to look for? Was this event cancelled? Anyone know? Back of the ticket includes free parking and lots of Lawyer talk. Tomorrow, we'll take a look at the "B" ticket! The Enchanted Tiki Room opened June 23rd, 1963. The attraction is in Disneyland, but it was owned by WED Enterprises, financially separate from Disneyland. WED was all Walt's, so like the trains, he must have had some neat arrangement where he got control and benefited twice, once through his WED company and again through Disneyland. Tickets to "Walt Disney's Enchanted Tiki Room" were NOT originally in ticket books sold at the main gate, they were sold separately at a ticket booth at or near the Tiki Room (anyone know exactly where?). From what I can tell, tickets for the Tiki Room were sold separately until October 1966. See a nice video clip of Walt talking about his Enchanted Tiki Room. 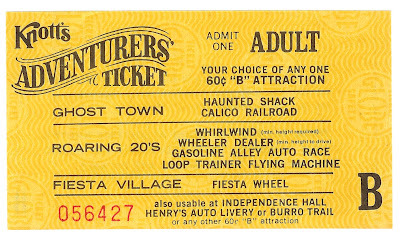 We start the 70's with an "A" ticket from May 1971 (also the Month and Year Magic Mountain opened in nearby Valencia, Ca.) Looking very much Like the May 1968 ticket from yesterday's post, but Sleeping Beauty's Castle is back from the "B" ticket! Notice now she gets the proper "s" after "Beauty", it always sounded odd without the "s". February 1974 introduces the smaller size that will remain until the bitter end (1981). I guess there also was some confusion about the vehicles that would be available so for a few years, they were simply listed as "Main Street Vehicles", my favorite Omnibus wasn't deemed worthy of its own ink! Was Eisner around in 1974? OMG, Sleeping Beauty's Castle is gone AGAIN!!! Last of line, this May 1980 "A" ticket is the latest I can find, they may have printed them after that, but I have yet to find any. 10 Cents is no longer stated, as was the case on all lettered tickets by the late 70's. Main Street got its individual vehicles back, and Sleep Beauty's Castle is once again back on the "A" ticket! 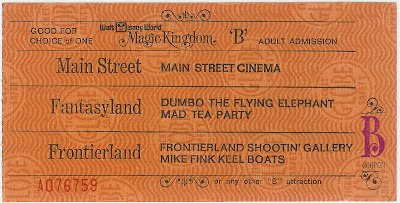 LAWYER ALERT: Notice the asterisk on certain attractions, from the back of the ticket book (shown below). "Children under seven must be accompanied by an adult on most attractions except those marked by an asterisk (*)". So I guess you could let those under 7 roam freely and unattended in the theaters, the castle, Mission to Mars? American Sings? Submarine Voyage?Does this make sense to anyone????? I hope you enjoyed this "A" ticket series, I sure did. This weekend; Saturday we will have the First Ever TikiRoom tickets as promised, then for Sunday, I'll post some really odd stuff.... Next Week, The "B" Ticket!